Magwell-Ice/DP/For Glock Small Frame/Black w/Black Insert, Aluminum, 2.9 oz NEW IMPROVED DESIGN THAT WORKS WITH MOST BASE PADS NEWLY DESIGNED PLUG FOR TIGHTER MAGWELL FIT THE SLICK REPLACEABLE INSERT GUIDES THE MAG BETTER FOR CONSISTANT FAST RELOADS COMES WTH ALL MOUNTING HARDWARE AND TOOLS EASY TO INSTALL, FITS IPSC AND IDPA BOXES New Glock Ice Magwell. The World's Fastest Magwell Is Finally Available for Your Race Glock. 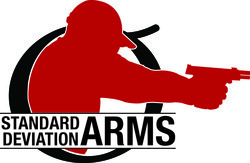 The Ice Magwell is the fastest, easiest, most consistent magwell for IPSC competition. And now it's available for Glock. If you want to add weight go with the heavy black Ice Magwell. It will help tame that recoil, but still reload slick as ice. When you beat up the insert, the magwell is untouched. Go ahead and pop in a new insert. It takes seconds and you will have it looking and functioning like a new magwell again. Black. Aluminum. 2.9 oz. Aluminum. Fits Small Frame Glocks 17, 17L, 34, 22, 35, and 31 only . WILL NOT FIT GEN 4!